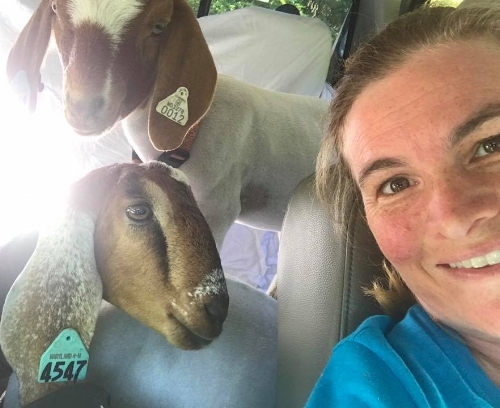 is President of Sustainable Resource Management, Inc. and the supervising forester for Eco-Goats. He has a BS in Forest Resource Management with a minor in Soil Science from West Virginia University. For more than twenty years, Brian's passion for sustainability has helped to shape the face of forestry practices in Maryland, West Virginia, New York, and Pennsylvania. inventory, reforestation, recreation and forest aesthetics and biodiversity. He consults on state, local, and federal forestry regulation and mediates disputes among industry, environmental groups and/or individual landowners. Brian has put his commitment for sustainability into action with a wide range of organizations, including Maryland Forests Association, The Maryland Environmental Trust; The Nature Conservancy; Green Ridge State Forest Advisory Committee; The Community Woodlands Alliance; The Hardwood Value Improvement Project; Empire State Forest Products Association; New York State Tree Farm Inspecting Committee; West Virginia Forestry Association; and the Allegany College of Maryland. He also works extensively with private landowners and homeowner associations. Jennifer holds a bachelor's degree in Landscape Architecture from Temple University and is a certified Chesapeake Bay Landscape Professional. She is a member of the Consortium of Support Professionals for the Anne Arundel County Watershed Stewards Academy, and is one of the founders of Cape Conservation Corps, a non-profit dedicated to promoting stewardship, educating neighbors and the ecological restoration of community lands in Cape St. Claire. Jennifer enjoys speaking to groups about native plants, stormwater mitigation and controlling invasive plant species. She is co-author of An Essential Guide to Woody Plants: The Flashcards Northeast Edition: Set One.